Have you been charged extra for blending paint on your panel repairs? Ever wondered why there may be extra charges added to your car repairs quote for blending & why it is necessary? 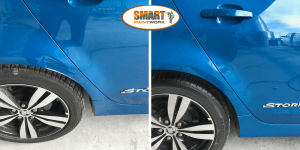 Blending paint on your panel repairs is a must to ensure your repair is undetectable. If the damage to your panel is centred on the panel the technician will have enough room to blend out the paint evenly. This is to ensure that there is no distinct repair paint line & the repair then being detectable. Our aim is to have the panel looking like there was never any damage there to begin with. If the damage is on the edge or close to the edge & you have a colour that is mentioned above, chances are that we will need to quote you for a blend panel. The technician will need to blend over onto the joining panel. Blending out on to the panel is necessary to ensure that the repair is completely undetectable between panels. 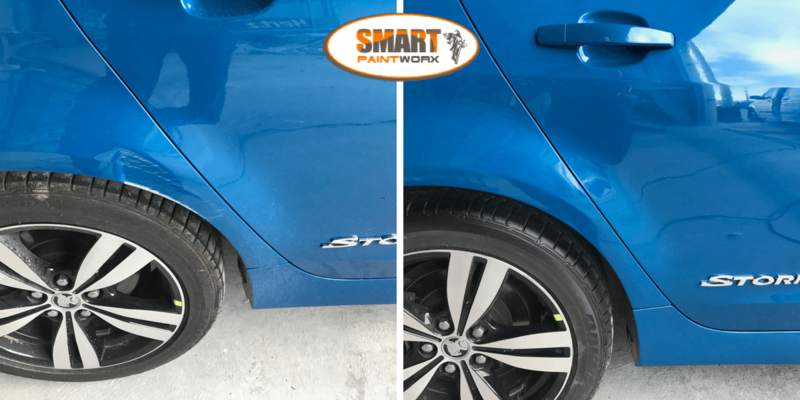 Bumper bars are always slightly different in colour due to the different texture so when working with any damage next to or on a bumper, blend panels are not required. Generally blend panels will cost as little as $88 – $132 + the cost of your actual repair. For a quote please send through your photos & info such as where you are located, your full name & your vehicle make/model. We will then be in touch with your options. This entry was posted in Blending Paint On Panel Repairs, repairing pearl or metallic paints. Bookmark the permalink.